How to Lose Weight – FAST! Home » Weight Loss 101 » How to Lose Weight – FAST! With the holidays coming, you’re probably worried about all the parties, delicious foods, and tempting treats you will be bombarded with. If you already have a few pounds to shed, the prospect of packing on even more weight can seem hopeless in even the strongest-willed dieter. Fortunately, there is a solution, and it comes in the form of expert assistance from Houston Weight Loss and Lipo Centers. With just a $99 initial visit, it’s never been more affordable to get started on the road to weight loss. From medical weight loss to liposuction, you don’t have to feel lost anymore when it comes to food. Are you a yo-yo dieter? Have you tried every fad and plan under the sun to no avail? Stop with the blame and start working towards something that actually works. Yo-yo dieting, also known as weight cycling, is the repeated loss and regain of body weight, with research showing a link between weight cycling and health risks, according to Medicine Net. It’s time to embrace a healthier lifestyle. If you not only want to lose weight but lose it fast, Houston Weight Loss and Lipo Centers is your answer. Your journey to effective weight loss begins with an initial visit to Houston Weight Loss and Lipo Centers, with two convenient locations in Houston and Katy TX. The goal of Houston Weight Loss and Lipo Centers is two-fold: to help people just like you reach and maintain healthy weight loss strategies through programs that actually work, and to help you get the body you want through the latest technologies in body sculpting such as laser assisted liposuction, Smartlipo. This is a laser lipolysis system featuring a minimally invasive procedure for fat deposit removal. Smartlipo™ boasts fewer side effects than conventional liposuction with no anesthesia or downtime. Before your scheduled visit, it’s helpful to staff members if you fill out our patient history forms online. This will better direct our healthcare providers to create a customized approach to your weight loss. From the very first visit, you will be put at ease through a comfortable environment and warm, friendly staff members. Used on a short-term basis, suppressants are drugs designed to reduce your appetite as a clinical treatment of obesity and weight loss promotion. On your initial visit, you will undergo a complete physical exam and battery of blood tests. The drugs you are ultimately approved for and prescribed aim to reduce hunger pangs and help you feel fuller longer on smaller portions. 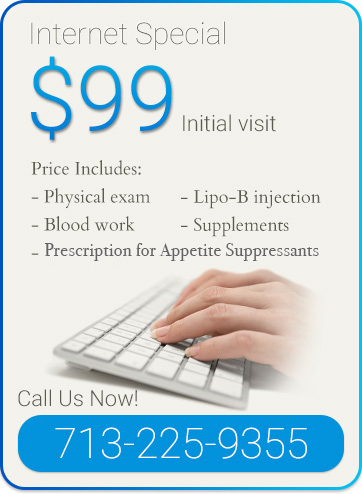 In addition to appetite suppressants, you may also qualify for Lipo B injections and supplement samples. Lipo B injections comprise three amino acids (Choline, Methionine, and Inositol) that help the liver process fats more efficiently in order to make weight loss easier to maintain. A customized plan of low-cal dieting will be prescribed based on estimated BMR (Basal Metabolic Rate). The experts at Houston Weight Loss recommend consuming between 1000 and 1600 calories per day comprised of regular food, meal replacements and combinations of the two. Cutting back on high-calorie and high-fat foods, in conjunction with high-protein shakes, fresh fruits and vegetables, is key to effective weight loss. All health professionals agree that a blend of healthy foods, exercise and supplements is the best way to achieve weight loss. However, if you need help, inspiration and direction when it comes to your own weight loss, lean on Houston Weight Loss and Lipo Centers. Please give us a call for more information or to schedule your consultation at 713-225-9355.